Loving God and people in the mountains of Haiti. It’s nearly midnight in Haiti. But it’s the last night for our team. For my teams, this means an emotionally draining night. The children know we leave shortly, and we are stuck in the bittersweet place where we are returning to spouses and family, but leaving friends in Haiti. Today, we were able to visit the school for one last day and meet new faces and say goodbye to familiar ones from Sodo. Then, a few members of our team were able to go to LaBoule, where Dr. Charles runs the medical clinic. We saw the new building project for a much larger church, and also visited the new medical clinic where he was seeing patients. Wednesdays in Haiti are great. During the day there is the market and at night is church meeting. Most of all it is about being able to just spend time in Haiti. Work has continued on the short term mission team house. The roof is completed and plumbing for two bathrooms has begun. The walls have been repaired and painting will begin tomorrow. The goal is for the house to accommodate 20-25 short term mission team members who are visiting Mountain Faith Mission in Saut d’Eau. My first trip to Haiti in September 2007 just happened to have me reading through the bible when this verse was on my schedule. And it has always stuck with me since that trip. When we think of Haiti, many times it is thought of as the poorest country in the Western Hemisphere. Or, the island that has been struck with hardships such as the earthquake of 2010, or the cholera outbreak that happened and has claimed the life of over 8,000 people. Or, maybe it is simply that poor country in the Caribbean plagued with corruption. Negative media can be found anywhere, but when I look at Haiti, James 2:5 sticks out. Haiti is the “poor” if the world to the westernized nations. We look at their way of life, lack of goods, and numerous other published issues and define them in that way. But experiencing Haiti in the sense we experience it completely shows the verse in James to be true. While there is an obvious financial difference shown…the truth is, we each feel as though we are in poverty as we serve in Haiti. Jamie Harger and I have sat and simply talked through this very observation. At night, as we sit on the porch, it transcends the human side of things. It is not a group of Americans and a group of Haitian children laughing and singing. There is something more. As we sing All Hail the Power of Jesus’s Name, there is worship. There is spiritual refreshment. And the truth is, it is typically the Americans who are brought into worship. 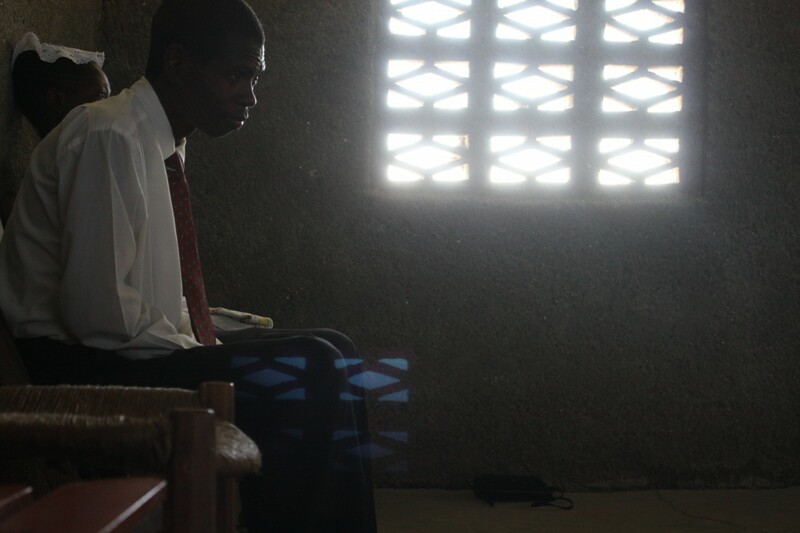 It is every day life for the Haitian children and people to worship each day. Singing and spending time together is a way of life. And as we are able to experience it and worship it fills us. It refreshes us. It shows that we are the ones who are poor, as our Haitian brothers and sisters, though “poor” by the world’s standards, are truly rich in faith. And their faith ministers to each of us. It is because of them that we come home with a burden. Not to change their way of life or thinking. In fact, my burden is not even for the Haitians. My burden is for myself. My hope is that I will have the faith that exudes worship in all that I do. I want the faith that walks daily with Christ. I want a faith that can bring others into the presence of God, simply by being with me. I am poor. But each time I experience Haiti, I find myself to be the richest man in the world. Another day in paradise, that is what we jokingly say this about Haiti. However if you’ve ever been here you know the sense in which this is a true statement. Waking up to the sound of roosters and a few Creole voices is one or the best feelings in the world. Today began with an early morning look at the old girls dorm where work continues on adding a roof. The trusses were set throughout the day by the Calvary Fellowship team. During the day the entire roof trusses were set in place with half of the metal sheeting complete. Sunday in Haiti is a wonderful day. Everyone is excited to be able to go to church and worship the Lord. Matt Fox from St. Louis explains it is nice to see Sunday observed and set aside without worrying about the day’s schedule. For me, waking up in Haiti is always a good start to my day. Hearing the sounds of voices and an occasional rooster crowing is just a great way to start my day. But today was an exceptional day as I was able to witness the marriage of one of our girls from the children’s home. Guerda Felixe is twenty-one years old and is such an amazing young woman. I have gotten to know her throughout my trips to Haiti and it was an honor to have her plan her wedding at the same time my group was here. Ryan’s Trip: Day 1 – We have arrived! After a long day, we are able to sit and rest. The day started at 3:00 AM in St. Louis, Missouri. Seven people from Calvary Fellowship Church loaded up for the annual trip to Haiti. Mike Prather, Matt Fox, Bob Roskowske, Jamie Harger, and I have traveled together to work with Mountain Faith Mission where I work with the children’s home. This year, we welcome two new faces to Haiti with Nicole Ridings and Eleanor Conley, one of my youth group students. Also joining us are my father in law from Nashville, TN and Casey Lewis from Washington, NC. Sitting on a grassy hill about a mile and a half hike and dugout canoe ride across the Artibonite River is a concrete and block building. It has a roof now, which has not always been the case. This tiny building, by American standards, is where the church of Balumette meets for services. If only we could see through the eyes and hear through the ears of the walls. If we could feel the love for Christ in the tears which have fallen on the concrete floor. Don’t be afraid, for I am with you. Don’t be discouraged, for I am your God. I will strengthen you and help you. I will hold you up with my victorious right hand.